Now you can try Google Docs even when you don't have a Google account. It's not difficult to create a Google account, but sometimes you want to show someone how Google Docs works without revealing sensitive information from your Google account. 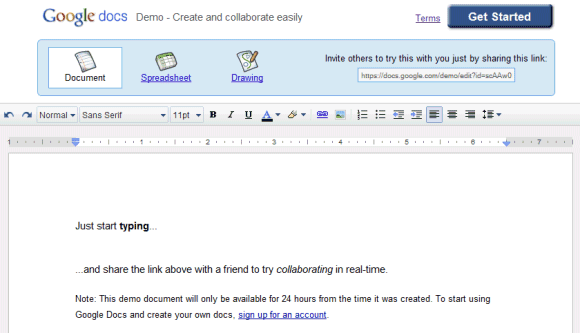 If you go to https://docs.google.com/demo/, you can start editing a document, a spreadsheet or a drawing and share the links with other people, so you can collaborate in real-time. Google says that the documents are only available for 24 hours from the time they are created. It would be nice to create documents in Google Docs or upload files to Google Docs without associating them to a Google account. Maybe they aren't very important or maybe they include important information that you aren't allowed to post. Well this is actually nice. Now maybe they do the same for Wave for those who aren't up for committing to an account but still want to collaborate on something? Awkward! They let you test the product but without the menu bar, so a couple of features are missing - most probably exactly those features you wanted to demonstrate. It feels like 'pretend driving' a car. Add a game development program like Lunar Magic to Docs and I'm sold! I can't see the benefit of this. As ahab says it is missing useful features - and also I can envisage collaborative documents being lost because of the 24-hr limit. I would see the benefit in not mandating an account to open a shared link you got from someone. It has a lot of benefit and also few disadvantage also. If people wants to share their documents without sharing with other people they compulssary need to create account. If the people want to share their documents with all the people then they have a lots of profit as it do not need to have account. Its really tempting as a sporadic means of insta-collaboration.